If audio reviewing were simply measuring, life would be a lot easier for reviewers and readers of reviews. But it is not just measuring; it is the process of arriving at a fair subjective assessment of a component after living with it for a while, and listening to it under a range of real-life conditions. That's my view anyway. It is always worth reminding one another just how variable and subjective this process is: ears differ, listening rooms differ, ancillary equipment differs. Add to this the fact that reviewers prefer different genres of music and enjoy different things in each genre, and the fact that recordings vary enormously in quality and it is impossible to think of reviewing as a scientific exercise. Yet the reviewer still wishes and needs to be fair to the component under review. After all, it has reached him (or sometimes even her) after a long process of research, development, production and distribution and usually represents a significant investment of time and money by music lovers. 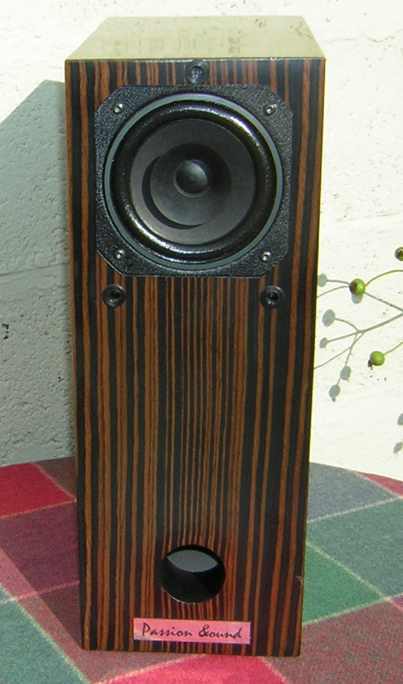 So, this review has taken a few months to complete, during which I have lived with these loudspeakers in three different rooms with four different amplifiers and a range of sources, digital and analogue. Forget the fantasy of an anechoic chamber. Think rather random household furniture. However, by listening to these speakers in a range of contexts, it is possible to combine the different impressions and get a sense of their overall character. This means that to do a review like this justice, one has to do a lot of switching around of sources and ampliffication, sometimes switching between different rooms. Having done so, I am confident that I have a sense of the overall character of these speakers. Combining my initial and final impressions and filtering all those in between, I conclude that these speakers offer the crisp, somewhat dry, presentation which is typical of full-frequency speakers. This review aims to try and explain this in more detail and then to consider who might enjoy the sound of these transducers. In appearance they are striking. They have an avante garde yet retro look. 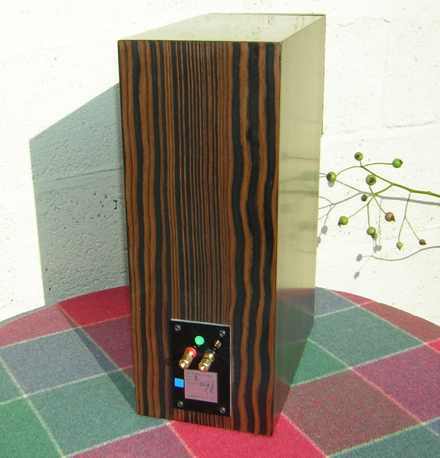 This is not particularly strange when you think that they are a modern implementation of an old horn type, in which the cabinet is designed to extend the low frequency range of a single full frequency driver. The handbuilt cabinets ('Handcrafted in ECC' as it says on the back) are constructed from high quality 15mm plywood, laminated with a choice of 2mm veneer hardwoods, and matt finished with a nitro cellulose varnish. Part of the premium quality of these loudspeakers lies in the unusual look and handmade quality of the enclosures. Premium models can be veneered in Walnut, Wenge, Ebony or Zebrano. While the speaker cabinets are well-finished, some other details could be improved, e.g. 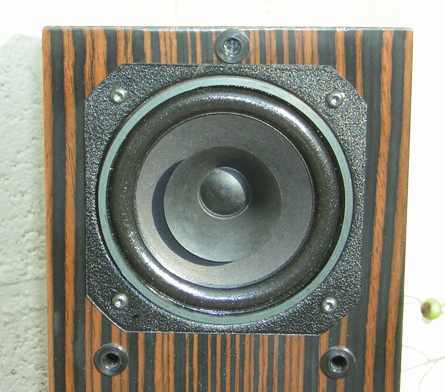 the foam grilles are mounted on quite basic frames and do not sit precisely square on the speakers. 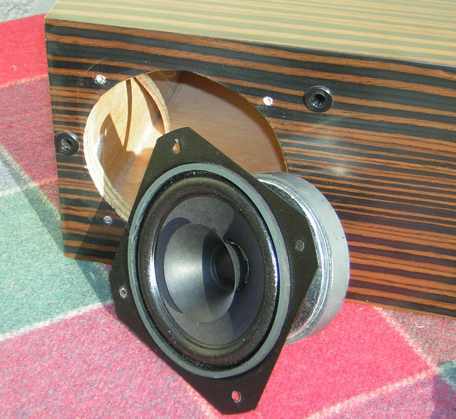 This needs fixing in speakers in this price range--unless you quite like this handbuilt touch! 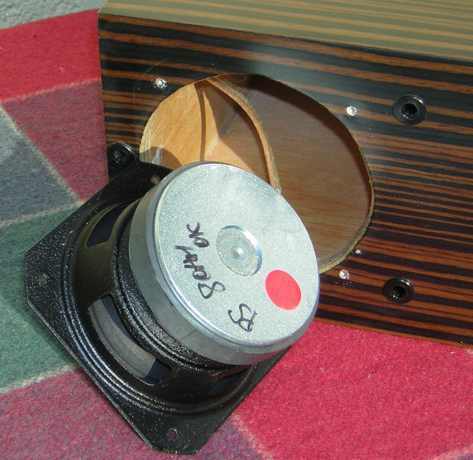 Internally, the speakers consist of two compartments. The smaller top one contains the driver unit. It has damping materials at the rear. Bass reflex sound from this compartment travels via a 2" pipe to the larger bass-ported compartment below. The speaker binding posts are pretty basic, but do the job, taking bare cables and banana plugs. Of course the art of constructing monitors like this is to select and make best use of materials, both in cabinet construction and choice of drivers. The 5" drivers are full-frequency units, with integral whizzer cones. Whilst the manufacturers do not state this on their website, it seems that the drivers are 4 ohm Monocors, with the model number SPH-64XAD. Another web review reports that Passion &ound has modified these drivers to improve their frequency range. The only marking on the drivers of the review units themselves is a note that they are 'matched'. Although the stated impedance of thses speakers is 8 ohms, measuring them at 6.5ohms at the terminals, I tried them with the 4 ohm taps of the valve amplifiers and found that they performed better that way. This is good news for people running classic valve amps with 3 or 15 ohm outputs, who might be considering these speakers for their systems. There are no internal filters between the binding posts and the drivers. Finally, at a mass of 4 Kg each, these speakers are much lighter than you would expect. I decided to test these speakers with tube amplifiers only, but using a range of digital and analogue sources. Why only tubes? Well, first because that is what I listen to these days. The solid state gear is packed away. More importantly, as these are sensitive speakers I thought they might be suitable for lower power tube amps. Also, I have already written a little about their sound with matching Class D Passion &ound PSi15 amps. See review. For my analogue sources, I used a Thorens TD135 MkII, with two different MM cartridges: a Shure M75EM and an EEI Parabolic 500 cartridge, which has a better elliptical stylus. Digital sources were a NAD 524, Rotel RCD965BX and a Sony Playstation PS1 (the early 'audiophile' model SCPH-1001 with the audio outputs). Amplification was provided by a Dynakit ST70 and quality tube preamp with 12AU7 tubes and a Melody integrated PS3 (yes, confusingly, this is the same model number as these monitors). Both of these amplifiers were running 5881 power tubes putting out around 35Wpc. I also tested them with a pair of rebuilt EL84 monoblocs from the late 1950s. These used a simple passive preamp 'pot in a box'. None have any tone controls. 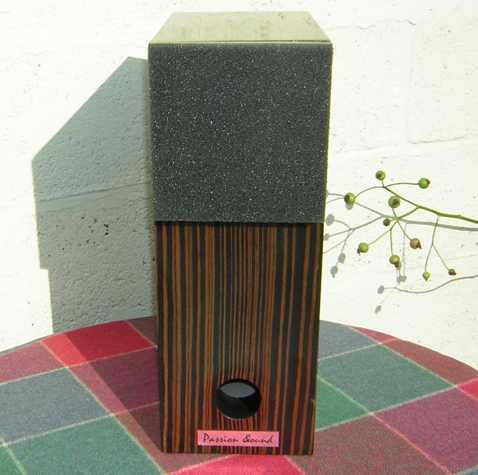 Given the sometimes dry sound of these speakers, it might be worth considering using a preamp with tone controls for some recordings. I compared these with two other sensitive speakers: KEF 104/2 (92dB) and some quality full frequency drivers from the 1960s (Philips 9710-M) in LNB Labyrinth 7 foot folded pipe cabinets. My overall impression with these speakers is: match them carefully. In particular, as I say, I found that they preferred 4 ohm outputs in both the Melody and the Dynakit amplifiers. First impressions with the Dynakit amp was that they offered the typically dry sound of full frequency drivers: a bit light in the bass, with a bit of a 'spindly' sound. But, with a clear and precise soundstage. Switching from the 8 ohm to the 4 ohm outputs brought a richer fuller bass. I still didn't really warm to these. As a test, I listened carefully to a track I know and love well: 'Don't Give Up' from Peter Gabriel's So. I was impressed by the musical nuance of the bass lines at the start of the track, but the vocals were too dry for my liking. I switched from vinyl to CD. The sound was more enjoyable with the smoother output of the Rotel. I wondered if the Shure M75 cartridge was not good enough for this amp and sure enough (sorr!) the sound was improved by the change to EEI cartridge. This shows that these speakers are pretty revealing and should not be used with a low quality sources or amps. On the positive side, they will complement quality ancillaries. For a completely different source and amp, I switched to the NAD 524 and sensitive 10W EL84 monoblocs. The amps have a 'darker' character than some other similar EL84 amps (compared with similar Heathkit MA12 monoblocs) a bit like the way the NAD 3120 or 3020 have a darker sound than similar SS amps. With this combination, the speakers again offered. The strong bass of these amps also matched the drier sound of the speakers. I was not in a position to change these amps to 4 ohm taps for this review (it involves resoldering connections), but I suspect that this would also yield even better results. The overall presentation was clear and open (the positive aspects of the speakers' 'dry' character). The vocals and instruments on Lucinda Williams' new CD 'Little Honey' were offered with more precision and presence than with my usual speakers. So, another good match. Finally, I tried them with the Melody SP3 and the Sony Playstation 1 as a smooth but clear source. This for me was the magic combination--it sounded terrific! Again, there was a difference between the 8 ohm to 4 ohm outputs, with the latter being significantly better. With good quality recordings all the frequencies were there, with the soundstage. This is a system I could happily stay with. One of Duke Ellington's big bands sounds just great as I write. It's time for some conclusions, subjective but considered. Thinking first of their physical appearance and low mass, I think the Passion &ound PS3s would suit people who want quality, but have a mobile lifestyle. These monitors significantly lighter than others of similar quality and so can easily be moved. Their narrow profile would suit a small apartment. Their high quality bespoke finishes mean that they can be matched with room decor and displayed with pride. Sound wise, with careful matching they offer a lot to enjoy, especially fine directionality and imaging. They do justice to higher quality sources and suitable amplification with 4 ohm output connections. While they work well with the Dynakit and the Melody, each 35Wpc, I suspect that they would also be worth trying with quality low powered amplification like a SET 300B. I do emphasise the need for correct matching, as they can show up the weaknesses of poor sources or inappropriate amplification, sounding a bit dry and even peaky. It would be ideal if buyers could audition these first, but in the absence of that, I would suggest that if the look and description appeals to you, you might start with these speakers and build a matching system around them. They can go plenty loud in a small room, but it might still be fun to try them with a subwoofer. They have more than adequate LF, but the small cabinets lack the full-bodied sound of larger units. When I switched between them and the much larger and heavier KEF 104/2s, I welcomed the return of a more full-bodied sound, though at the cost of a less well defined soundstage. Ah well, these are the trade-offs that make hifi an ever fascinating process of exploration.